Climate change can shift rainfall into fewer, more intense events with longer dry periods, leading to changes in peatland hydrology and carbon cycling. We manipulated rain events over three peatland plant types (moss, sedge, and shrub). We found increasing regime intensity led to drier surface soils and deeper water tables, reducing plant carbon uptake. 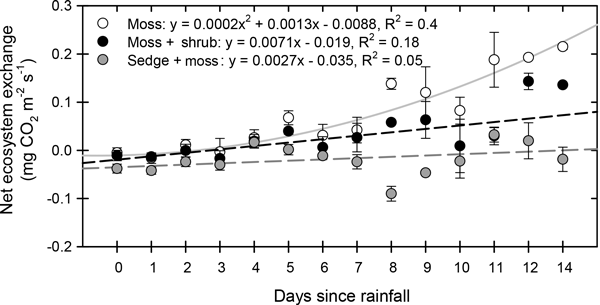 Mosses became sources of CO2 after >3 consecutive dry days. This study shows peatlands may become smaller sinks for carbon due to rain changes. Over-enrichment of nitrate can pose substantial risk to the quality of freshwater ecosystems. Hence, understanding the dynamics of nitrate is the key to better management of waterways. 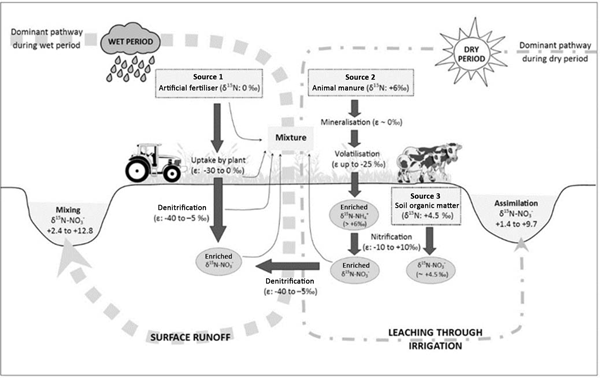 This study evaluates the relationship between the effects of land use and rainfall on the major sources and processing of nitrate within and between five streams in five catchments spanning an agricultural land use gradient. We found that rainfall exerted significant control over the fate of nitrate. 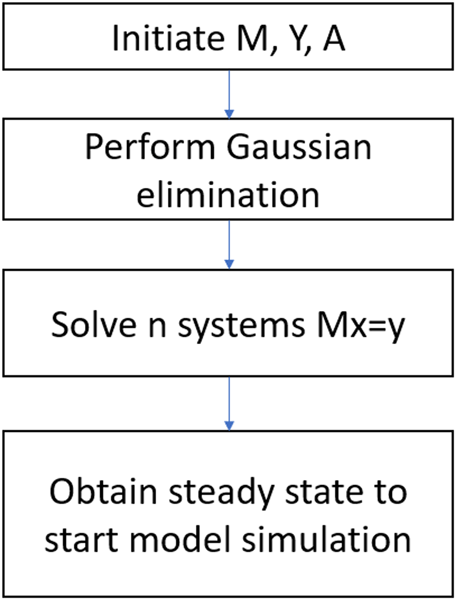 We developed an algorithm for a fast spin-up by finding the exact solution of a linearized system representing the cyclo-stationary state of a model and implemented it in a biogeochemistry model, the Terrestrial Ecosystem Model. For the test sites with five different plant functional types, the new method saves over 90 % of the original spin-up time in site-level simulations. The developed spin-up method will be used for future quantification of carbon dynamics at fine spatiotemporal scales. Oxygen deficiency is a major environmental problem deteriorating seafloor habitats especially in the coastal ocean with large human impact. 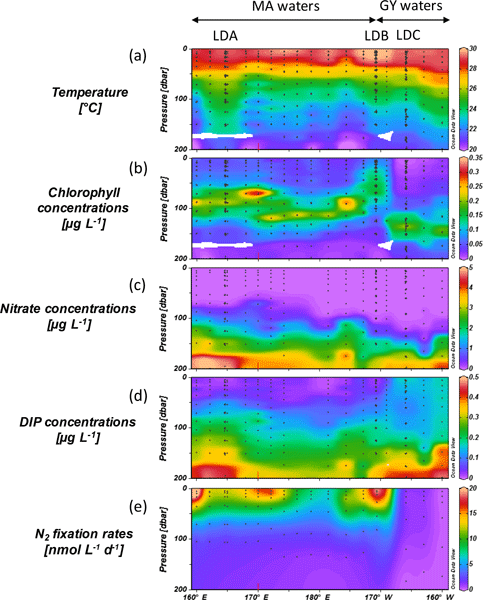 Here we apply a wide set of chemical and physical analyses to a 1500-year long sediment record and show that, although long-term climate variability has modulated seafloor oxygenation in the coastal northern Baltic Sea, the oxygen loss over the 20th century is unprecedentedly severe, emphasizing the need to reduce anthropogenic nutrient input in the future. 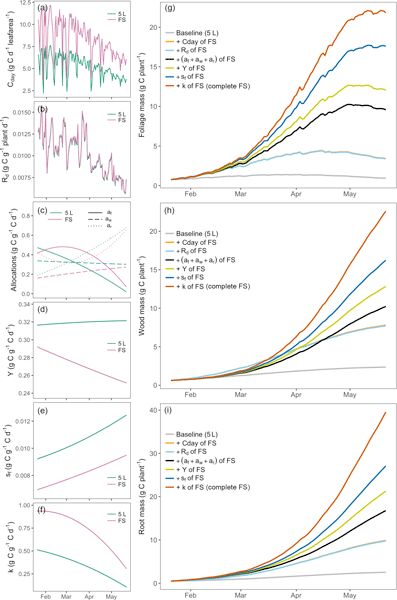 A major limitation of current terrestrial vegetation models is that we do not know how to model C balance processes under sink-limited conditions. 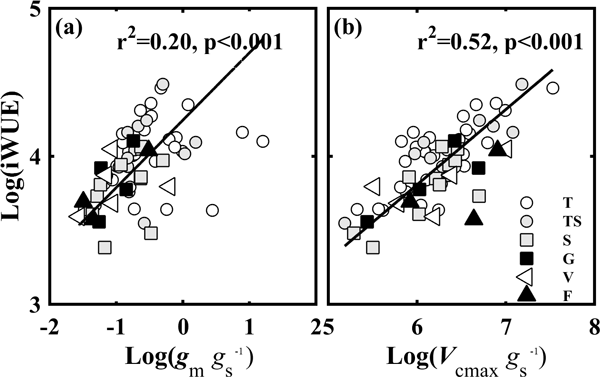 To address this limitation, we applied data assimilation of a simple C balance model to a manipulative experiment in which sink limitation was induced with low rooting volume. Our analysis framework allowed us to infer that, in addition to a feedback on photosynthetic rates, the reduction in growth was effected by other C balance processes. This study shows that leaf quantity and leaf age have an important effect on seasonal changes in isoprene emissions and that these could play an even more important role in regulating ecosystem isoprene fluxes than light and temperature at seasonal timescales in tropical forests. These results bring novelty and new insight for future research because in the past leaf phenology was not considered as an important factor that controls biological processes in the tropics. 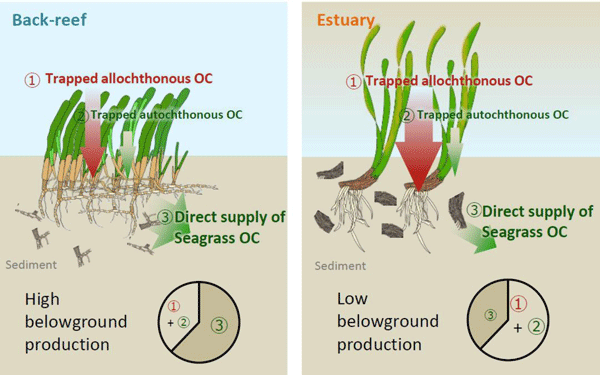 We empirically show that not only suspended-particle trapping but also the direct supply of belowground seagrass detritus can be the dominant organic carbon enrichment pathway of seagrass sediments. The relative importance of these two pathways may depend on the belowground biomass productivity. Our work identifies a previously overlooked factor controlling the carbon sink capacity of seagrass meadows and contributes to more precise estimates of global blue carbon stocks. 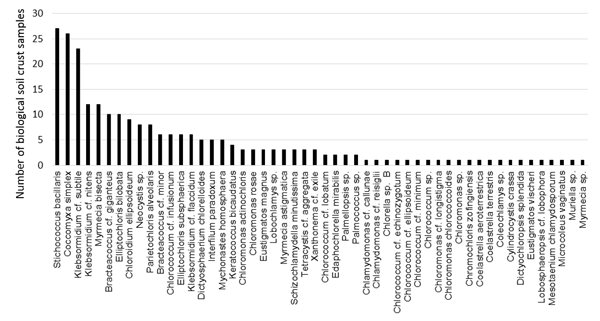 Benthic archaea comprise a significant part of the total prokaryotic biomass in marine sediments. 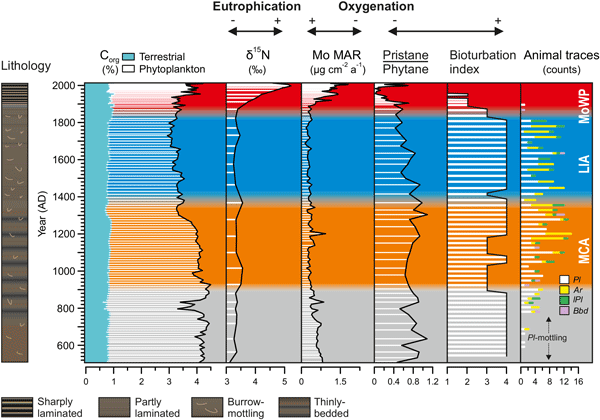 Here, we compared the archaeal diversity and intact polar lipid (IPL) composition in both surface and subsurface sediments with different oxygen regimes in the Arabian Sea oxygen minimum zone. The oxygenated sediments were dominated by Thaumarchaeota and IPL-GDGT-0. 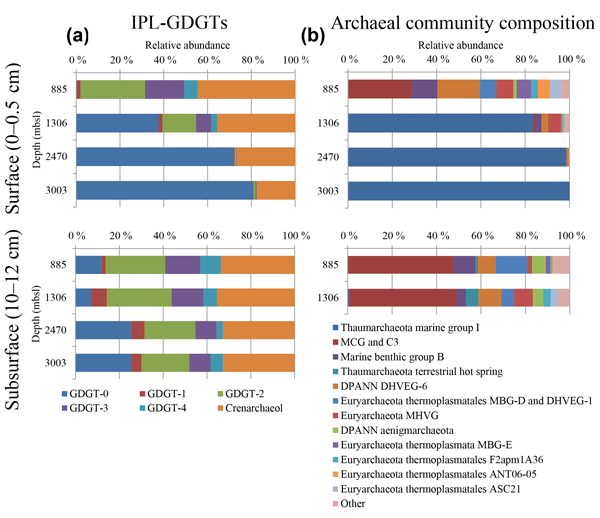 The anoxic sediment contained highly diverse archaeal communities and high relative abundances of IPL-GDGT-1 to -4. The standard quasi-analytical algorithm (QAA) was tuned for various ocean color sensors as QAA-V and optimized for and evaluated in a variety of waters from highly absorbing and turbid to relatively clear shelf waters. The QAA-V-derived optical properties of total absorption and backscattering coefficients showed an obvious improvement when compared to the standard QAA and were used to examine suspended particulate matter dynamics in Galveston Bay following flooding due to Hurricane Harvey. Oxidative weathering of sedimentary rocks can release carbon dioxide to the atmosphere. Here, we designed a chamber-based method to measure these CO2 emissions directly for the first time. The chamber is drilled in the rock and allows us to collect the CO2 to fingerprint its source using carbon isotopes. We tested our method in Draix (France). The measured CO2 fluxes were substantial, with ~20% originating from oxidation of the rock organic matter and ~80% from dissolution of carbonate minerals. In the context of the OUTPACE cruise and THOT project in the western South Pacific Ocean, we use individual float trajectories in order to understand the intermediate-flow dynamics, from 300 to 1000 m depth. 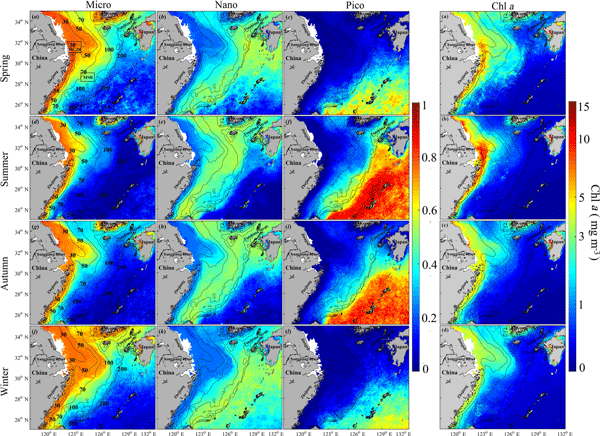 We highlight two main features: exchanges of water between parallel jets entering the Coral Sea through eddies and intermediate-wave influence of the currents in the frontal area connecting the Antarctic intermediate water (AAIW) and North Pacific deep water (NPDW) masses. To test our previous hypothesis that under drought stress, plant-induced ethylene can reduce soil methane oxidation capability, we manipulated a field trial in which maize plants were grown with and without ethylene production under drought via the addition of AVG (an ethylene biosynthesis inhibitor). We found that AVG significantly increased soil methane oxidation rates. Our result provides evidence for a positive feedback between plant stress, ethylene production, and methanotrophic activity. Extraction of polymetallic nodules will have negative impacts on the deep-sea ecosystem, but it is not known whether the ecosystem is able to recover from them. Therefore, in 1989 a sediment disturbance experiment was conducted in the Peru Basin to mimic deep-sea mining. Subsequently, the experimental site was re-visited 5 times to monitor the recovery of fauna. We developed food-web models for all 5 time steps and found that, even after 26 years, carbon flow in the system differs significantly. Long-chain diols (LCDs) are biomarkers that occur widespread in marine environments and also in lakes and rivers. 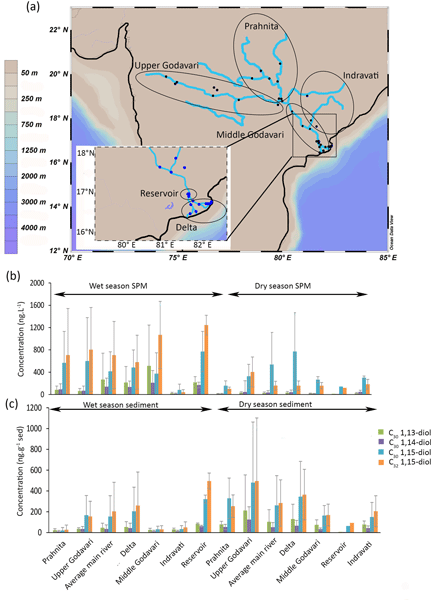 In this study, we looked at the distribution of LCDs in three river systems (Godavari, Danube, and Rhine) in relation to season, precipitation, and temperature. We found out that the LCDs are likely being produced in calm areas of the river systems and that marine LCDs have a different distribution than riverine LCDs. Millennial-scale changes in oceanic CO2 uptake due to global warming are simulated by a GCM and offline biogeochemical model. Sensitivity studies show that decreases in oceanic CO2 uptake are mainly caused by a weaker biological pump and seawater warming. Enhanced CO2 uptake due to weaker equatorial upwelling cancels out reduced CO2 uptake due to weaker AMOC and AABW formation. Thus, circulation change plays only a small direct role in reduction of CO2 uptake due to global warming. The different contributions of gs, gm, and Vcmax to A indicated that plants utilized diverse trade-offs between CO2 supply and demand to maintain relatively high A. The iWUE was relatively low, but ranged widely, indicating that plants used a "profligate/opportunistic" water use strategy to maintain their survival, growth, and the structure of the community. These findings highlight the importance of covariation of gs, gm, and Vcmax for the adaptation of plants to the harsh karst environment. 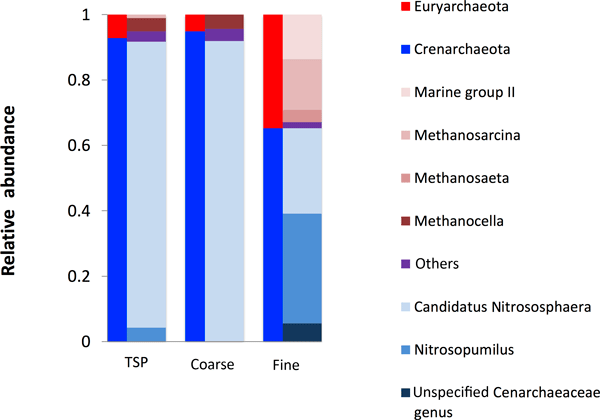 Archaea as a third domain of life play an important role in soils and marine environments. Although archaea have been found in air as a part of the atmospheric bioaerosol, little is known about their atmospheric dynamics due to their low number and challenging analysis. 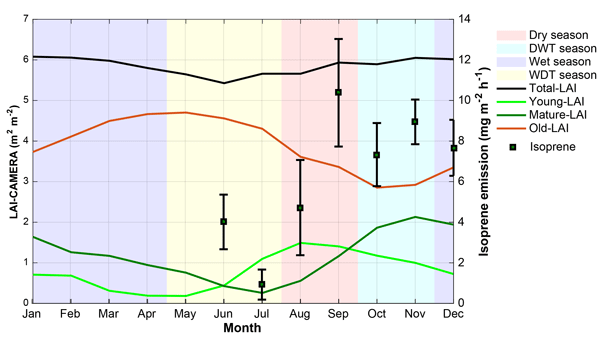 Here we present a DNA-based study of airborne archaea, show seasonal dynamics, and discuss anthropogenic influences on the diversity, composition, and abundances of airborne archaea. To investigate how grazing alters litter composition, quality and decomposition, we collected litter from grazing (GP) and grazing exclusion paddocks (GEP) and incubated them in situ and across sites. 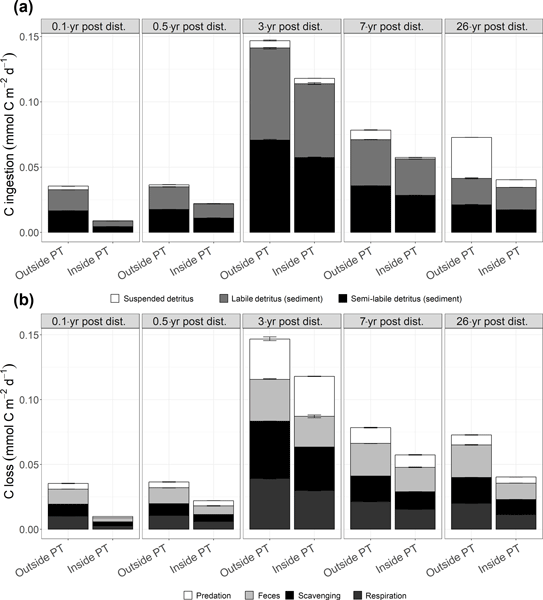 Grazing increased litter N and grazing exclusion increased litter mass of palatable species and promoted SOC. Litter decomposed faster in GP and N was opposite. 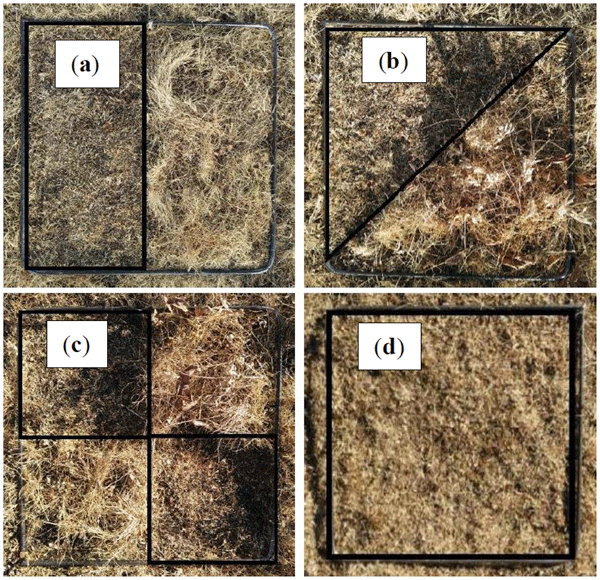 Site environment had more impact on litter decomposition. Results may be helpful in developing strategies to restore degraded grasslands. Potential gains in terrestrial carbon sequestration over Europe from elevated CO2 can be partially offset by concurrent rises in tropospheric O3. The land surface model JULES was run in a factorial suite of experiments showing that by 2050 simulated GPP was reduced by 4 to 9 % due to plant O3 damage. Large regional variations exist with larger impacts identified for temperate compared to boreal regions. Plant O3 damage was greatest over the twentieth century and declined into the future. The PSC model was re-tuned for regional application in the East China Sea, and successfully applied to MODIS data. We investigated previously unknown temporal–spatial patterns of the PSC in the ECS and analyzed their responses to environmental factors. 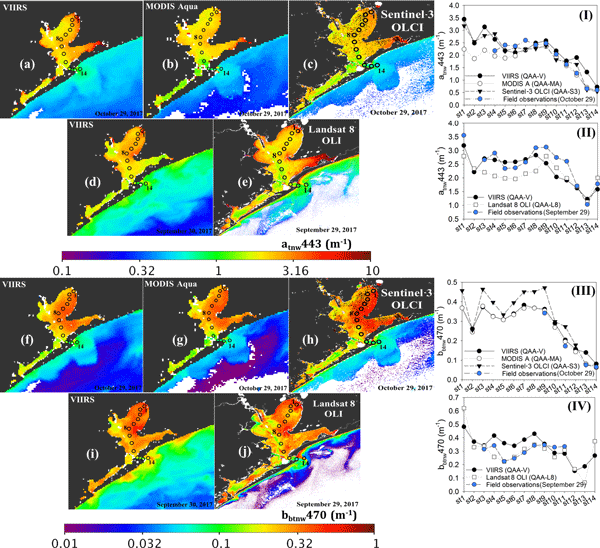 The results show the PSC varied across both spatial and temporal scales, and was probably affected by the water column stability, upwelling, and Kuroshio. In addition, human activity and riverine discharge may impact the PSC dynamics. pH in coastal waters can be highly variable. A means to measure this variation is needed. 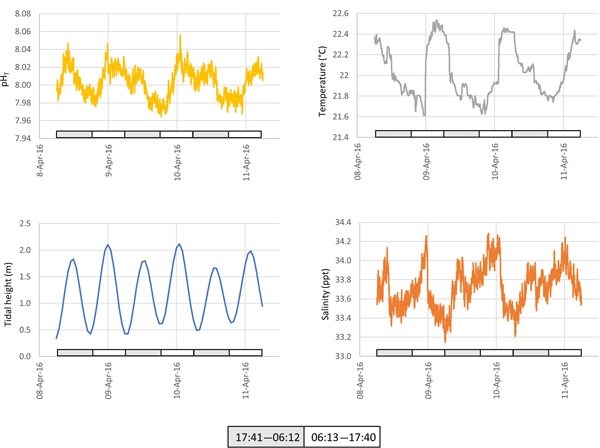 A fully autonomous submersible fluorescence-based pH monitoring device incorporating additional sensors for temperature and salinity was deployed in or adjacent to a shallow estuary for week-long intervals. Results and calculated aragonite/calcite saturation values are presented. The device is well suited to continuous flow-through or stand-alone measurements with a precision of at least 0.007 pH units.